A 'rmarkdown' template that supports company logo, contact info, watermarks and more. Currently restricted to 'Latex'/'Markdown'; a similar 'HTML' theme will be added in the future. This package is intended for data scientists, statisticians, and allied scientists who use rmarkdown to conduct reproducible research but require flexibility in document formatting. It is based on a pre-existing latex template that we have updated for use in RStudio or equivalent environments. A notable inclusion is a feature allowing the user to save develop a common configuration file, which can be shared among the team within a working environment. Here are the list of options that is available in memor. As with the default rmarkdown template, not all need be specified. At the same time, it can also take all the other options from rmarkdown::pdf_document, such as keep_tex, includes, etc. In the interest of reducing the length of 'yaml' headers and allowing for standardization within teams, we have developed a mechanism that allows one to save one's configuration or "profile" in an isolated file, which can be reused for other reports and shared with colleagues. During the process of rendering, information saved in the profile file will be automatically pulled and used to generate the final document (but information defined in local environment will be used with priority). To better facilitate this process, we created a RStudio Addin to help you quickly locate the file. This addin does nothing but to open up the ~/memor-profile.yaml file in your home directory (if this file doesn't exist, it will create one). Note that if you have a profile but you don't want to use the profile for certain document, you can disable this behavior by setting the use_profile option to false. 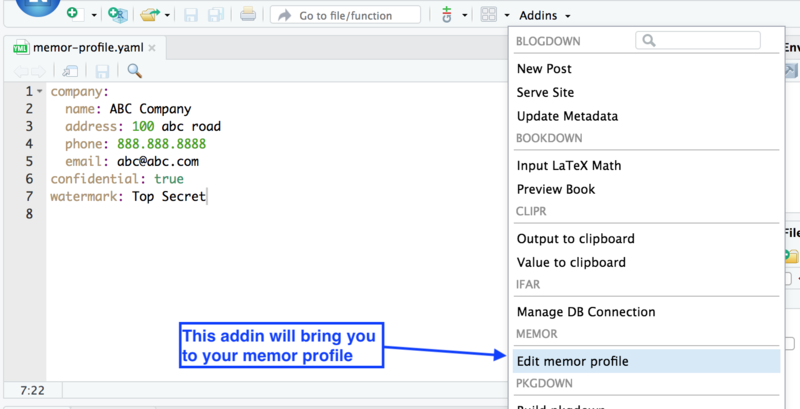 Furthermore, you can customize the location of the profile file by using the memor_profile option, which can be specified in a .Rprofile. This might be useful on a RStudio Server, where system admin can specify a R profile for everyone. In this way, the entire group will share the same file by default. This package was funded in part by a development project from the Biostatistical Design and Analysis Core of the Boston Pepper Center (AG031679-07). We appreciate additional support from the Hebrew SeniorLife Institute for Aging Research.